"Dedicated to Annie Turner Wittenmyer"
Image of the Annie Turner Wittenmyer Sculpture on the campus of the University of Northern Iowa in Cedar Falls, Iowa. 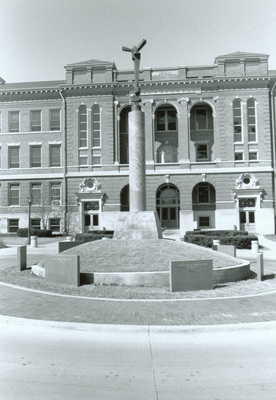 The sculpture by Tom Gibbs was installed east of Lang Hall in 1996. The medium is bronze and stone. "Dedicated to Annie Turner Wittenmyer" (2019). Art on Campus Photographs. 89.